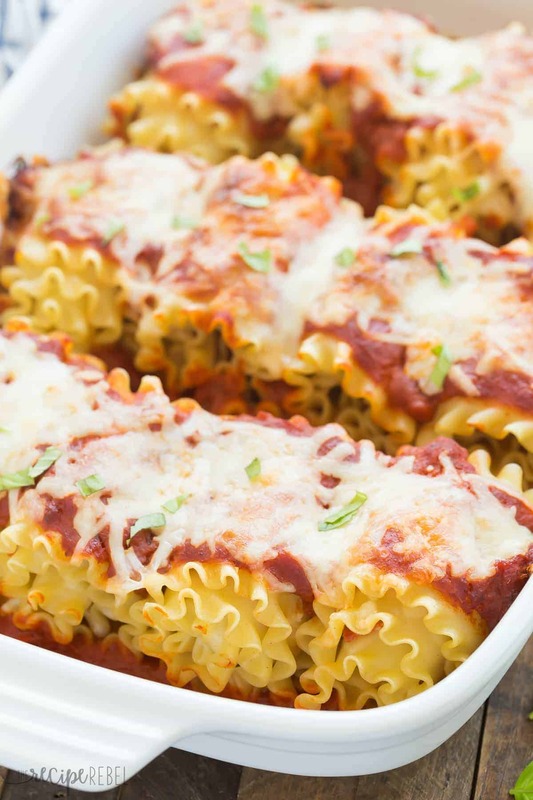 These Pepperoni Pizza Lasagna Roll Ups are an easy, kid friendly meal perfect for back to school! Make ahead, freezer meal and gluten-free options. When I was pregnant with our first daughter, I made a whole whack of freezer meals. I mean, I had time (with no other children wrapped around my legs), so I just went positively nuts. I made frozen pizzas, I made casseroles (chicken spaghetti and chili cheese biscuit casserole), I made breakfast burritos and I frozen precooked ground beef, and chicken and rice. I did it all. The thing is, our first daughter was a dream baby. She was so easy! She slept all the time, particularly for the first 6 or so months of her life. She’d be awake for maybe 45 minutes and then go back down for another 3 hour nap (basically, until I decided it was time for her to wake up and eat something). So it turns out I had all these freezer meals ready to go, meanwhile I was going crazy with boredom because I had nothing to do. I wasn’t even blogging yet, so I had an actual maternity leave (and although my employer offered to let me take 14 months I chose to go back at 12). Please no hate mail — I assure you that #2 was the complete opposite, and since I was blogging and did have a 2 year old, it was pure chaos. So I’ve had my share of “what am I possibly going to make for dinner with this baby on my hip?! ?” days. 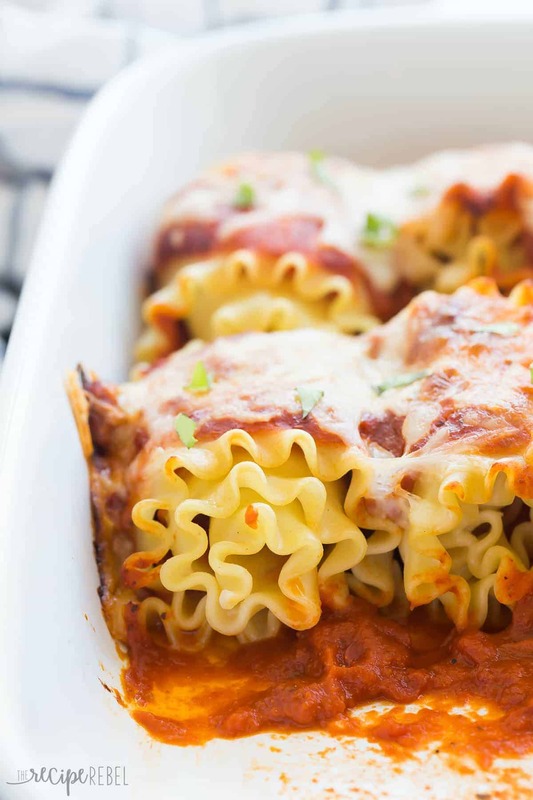 Lasagna roll ups have always been one of my favorite freezer meals. It’s a little different than lasagna, but when you bake them up they are just as good as they would be fresh. You can flash freeze them and then place them in large freezer bags and just pull out a few at a time, and you can really mix them up any which way you want! For us, it’s win-win. And since baby #3 is on its way (coming November! ), I would love to hear what your favorite freezer meals are. This time I’m pretty sure I’m going to need them! These can easily be made ahead, up to 24 hours. Simply assemble, cover with plastic wrap and bake when needed! See recipe for freezer instructions. Bump up the veggies: add mushrooms, peppers, spinach, anything your heart desires! 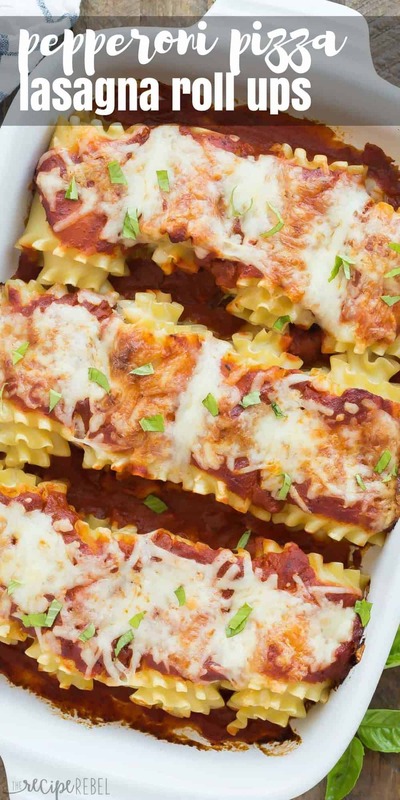 These can easily be made gluten-free by using gluten-free pasta and double checking all of your ingredient packages (look carefully for gluten-free pepperoni!). In a large pot of boiling, salted water, cook lasagna noodles until al dente (8-10 minutes). Drain and cover with cold water to cool immediately. Drain and lay out on a clean, lint free kitchen towel. Preheat the oven to 375 degrees F and lightly grease a 9x13" baking dish. Divide the pepperoni and 1 cup of cheese evenly between the lasagna noodles and roll up as tightly as possible. Spread a thin layer of pizza sauce on the bottom of the baking dish and place all rolls on top. Spread with remaining pizza sauce and top with remaining cheese. Cover with tin foil and bake for 25-30 minutes until bubbly and hot. Uncover and broil if desired (keep in mind that the edges of your pasta will become crispy). Garnish with fresh herbs if desired and serve immediately. I think both of those would be amazing! 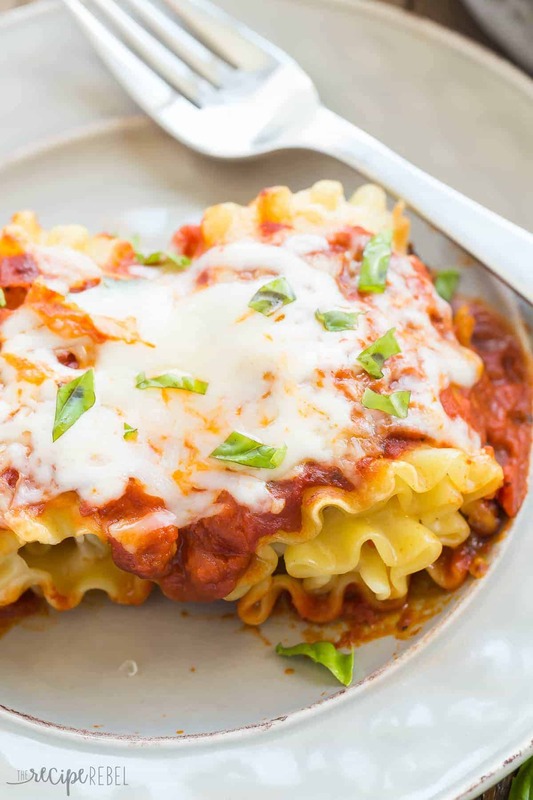 Lasagna is definitely one of my favorite freezer meals. It freezes so well and still tastes amazing when heated up! These roll ups sound awesome. I don’t have kids but I imagine that they would love this. I mean adults would too because come on…pepperoni and cheese?? YUM. Yes, ours too! Meat and cheese are always a win here! I’m not too good when it comes to freezer meals, so this sounds like just the dinner I would want on my plate AND in my freezer. And even better that my husband would adore these! Love the pizza lasagna combo, Ashley! Thanks Gayle! It was a big hit with the kids!